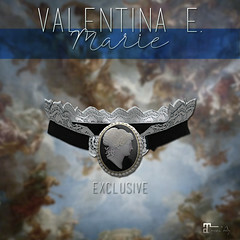 September 2017 – Valentina E.
NEW! Valentina E. Edith Ensemble @ UBER! 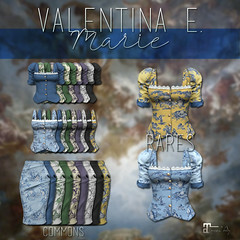 NEW at UBER September 25th the Valentina E. Edith Ensemble exclusively for Maitreya Lara! Available in four color options for mixing and matching. Wear the Edith Bow Blouse or The Edith Belted Jacket with the coordinating pencil skirt. Demos available at the event and at our main location. NEW! Valentina E. Valesca GACHA @ Lootbox! Out now at The Lootbox Gacha Event the new Valentina E. Valesca Gacha! This provocative silk gown is exclusively for Maitreya Lara. For just 50 L play for ten commons and one rare. Don’t forget the rares at Lootbox contain TWO secret bonus items! NEW! Valentina E. Helga Ensemble @ The Fantasy Collective! Out now at The Fantasy Collective the new Valentina E. Helga Leather Skirt and Shoulder Fur. Available in four finishes, Find a demo at our main location and at the event. This item is exclusively for Maitreya Lara.